An enjoyable if lightweight adventure in an exotic land with romance, drama, humour and droll characters, Torrid Zone delivers ripe fruit. Steve Case (Pat O'Brien) is the highly strung manager of an international fruit export company based in a literal banana republic. Case controls chief of police Juan Rodriguez (Frank Puglia), and orders him to deport newly arrived lounge singer Lee Donley (Ann Sheridan) because she is too hot for the locals. 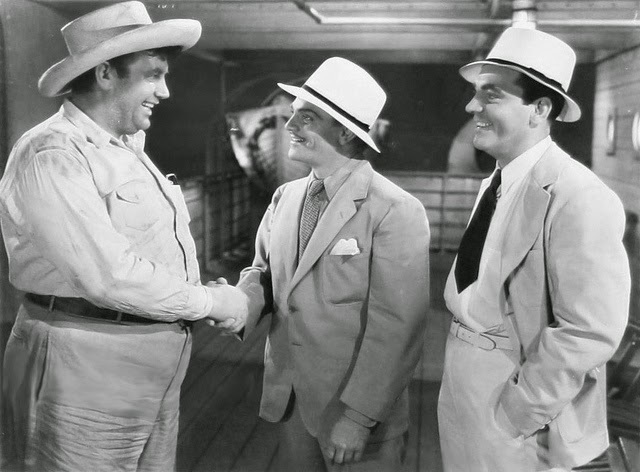 Case and Rodriguez also have problems with revolutionary leader Rosario (George Tobias), who is at least temporarily behind bars, while Plantation 7 is under-performing ever since Case's best man Nick Butler (James Cagney) quit after having an affair with Case's wife. The new man Anderson (Jerome Cowan) and his wife Gloria (Helen Vinson) are overwhelmed and unable to cope with Rosario's hit and run raids. Case cajoles Butler back to work with the promise of a big bonus, Lee avoids deportation by easily duping Rodriguez and sidling up to Butler, Rosario escapes the execution squad and gets back to the mountains to lead his men. Butler tries to whip Plantation 7 back into productivity while figuring out a way to find Rosario's mountain hideout and subdue the revolution. But the real battle is on the plantation, where Lee and Gloria are hissing at each other, in a claws-out battle to claim the queen banana crown. That Torrid Zone does not bother to name the country where all events are taking place is a good clue to the film's attitude. The opening globe hints at a country somewhere near the equator, and that's all that needs to be revealed. This is a jungle romp played very much tongue in cheek, and although broad comedy is not the intent, the film aims for, and mostly achieves an amiable vibe where the actors are having fun trading barbs, the outcome is predetermined, happy and not very important. Lee (to Case): Mister, the stork that brought you must have been a vulture. Director William Keighley, never accused of trying to infuse quality where none is needed, hustles the action along to can the movie in 88 minutes. He also forgets to provide any guidance to the likes of Pat O'Brien, who shouts his way through the film with the deftness of a gorilla, and Andy Devine (as a Case loyalist and Cagney's sidekick at Plantation 7), who deploys his high pitched squeaky voice to distraction. Cagney just plays himself and easily gets away with it, while Ann Sheridan emerges as the star of the film. Lee (cutting off Butler's shirt so she can dress his wound): Oh, did I hurt you? Butler (sarcastically): Oh, no. How could you hurt me by sticking a scissors in my arm? While the character of Lee Donley has no business being in this unkempt environment or anywhere near men like Nick Butler, Steve Case or Rosario, the script plonks her there to stir the pot, and stir she does. Sheridan glides through the movie with the silkiness of Bacall on her most dangerous days, and gets all the best lines. Her verbal duel with Gloria Anderson is filled with gems, as two cats go at it in the jungle heat. Lee (picking up a cigarette dropped by Gloria): I believe this is how the Chicago fire got started. Gloria: The Chicago fire was started by a cow. The rest of the film stumbles along, large quantities of fruit moving on impressive trains, punctuated by Rosario cheating death on several occasions to continue leading his people's revolution. His guerrilla army seems to mainly consist of a small band of smelly nitwits more interested in banter than fighting, but it's all besides the point. Torrid Zone is a place where nothing is serious, and all the real action happens in the form of zingers paving the way for Nick and Lee to fall into each other's arms.